5 Ounces Shrimp – peeled and divined. In a bowl combine: Garlic Powder, Cumin, Chili Powder, Paprika and 1 teaspoon of the Lime Juice. 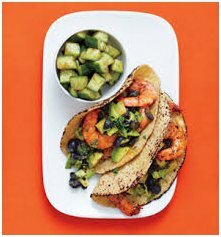 Toss in 5 ounces Shrimp. Add mixture to skillet with Olive Oil. Saute over Medium Heat until cooked through / about 5 minutes. In a bowl combine: Avocado, Mashed Blueberries, Cilantro, 1 teaspoon of the Lime Juice and Salt & Pepper to taste. Spread Yogurt on each of the Corn Tortillas. Divide Shrimp Mixture and Blueberry Salsa between Tortillas. Enjoy! Our team is headed to Catersource! Cutting Edge Events: There are a variety of innovative events planned to experience first hand fresh new ideas in action! Contests: Competition between caterers unlocks a creative streak than everyone can learn from and be proud of! Tradeshow: The most all-inclusive catering tradeshow in the industry is full of products, vendors and ideas – One stop shopping to all thats new in the catering world! 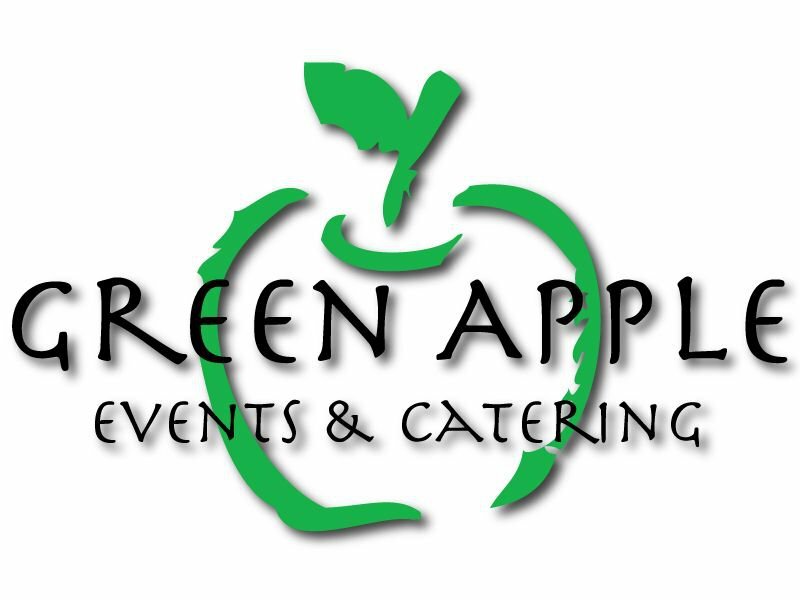 It is Green Apple’s commitment to you, our valued customers that we continue to expand our knowledge base and stay on the cutting edge of our culinary skills, food presentation and event planning! As we start this month’s newsletter we just have to acknowledge our Hawks epic season and Super Bowl WIN! What a ride for the fans and the City of Seattle! The Green Apple team catered several Play-Off and Super Bowl parties along with many other great events. 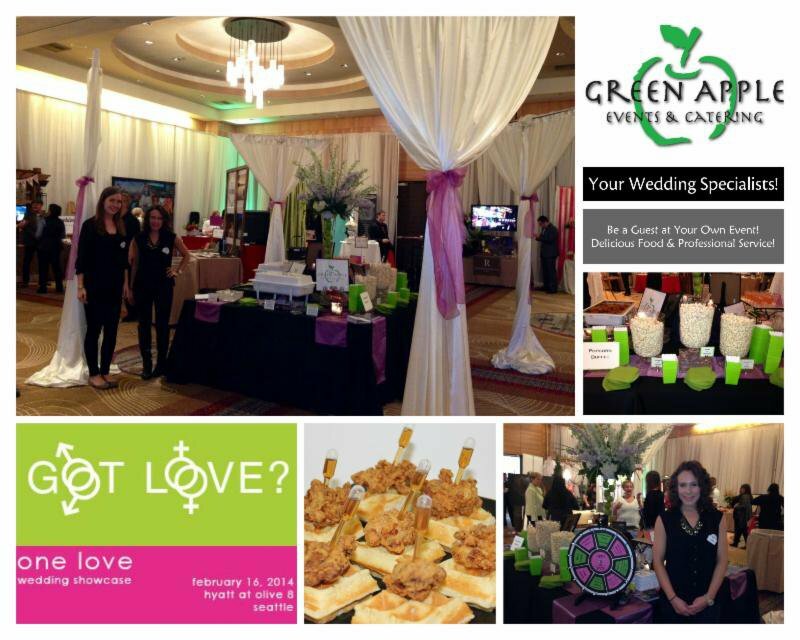 In addition to Super Bowl festivities, we showcased Green Apple at the One Love Wedding Show where we met some wonderful couples. To our existing customers, we are honored to be called “your caterer” and to our new customers, we look forward to catering for you! As always, we are here to serve! 1909 by a contractor from Seattle, the roof is a perfect half circle, rafters are the same pattern as used in the forms for railroad tunnels. 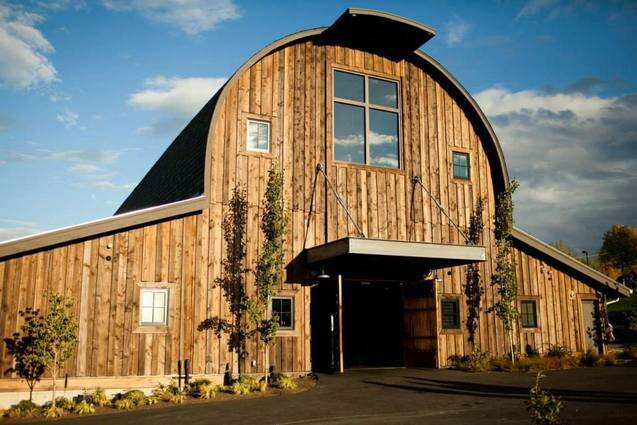 In 1991, the Olson house and barn was designated as a King County landmark. The Olson Mansion is beautifully restored and a great venue for a wedding or a corporate party!